This I may say is the first time I have been at church in California, led here at last, every door graciously opened… the sweetest church music I ever enjoyed. 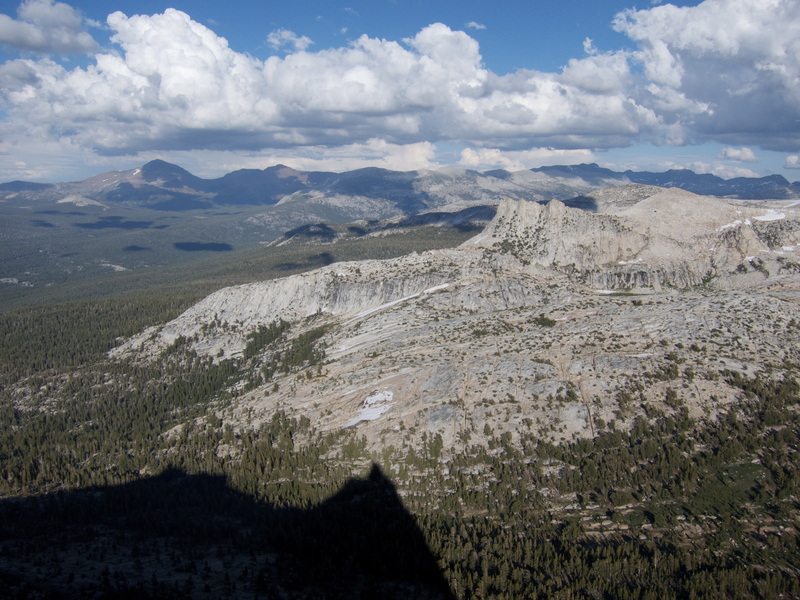 I can’t say that my experience ascending Cathedral Peak for the second time was on par with Muir’s first. For starters I didn’t do it in cowboy boots. But I can say that I’ve never been to an actual church in California. I can also say that years of fortunate experiences have allowed me to enjoy being on top of such spectacular summits. However, it’s the music and the company that made this trip especially enjoyable. The day after Ben and I linked up Royal Arches and North Dome we wanted to repay Linda, Marzena and Jill for graciously picking us up at the end of that adventure. 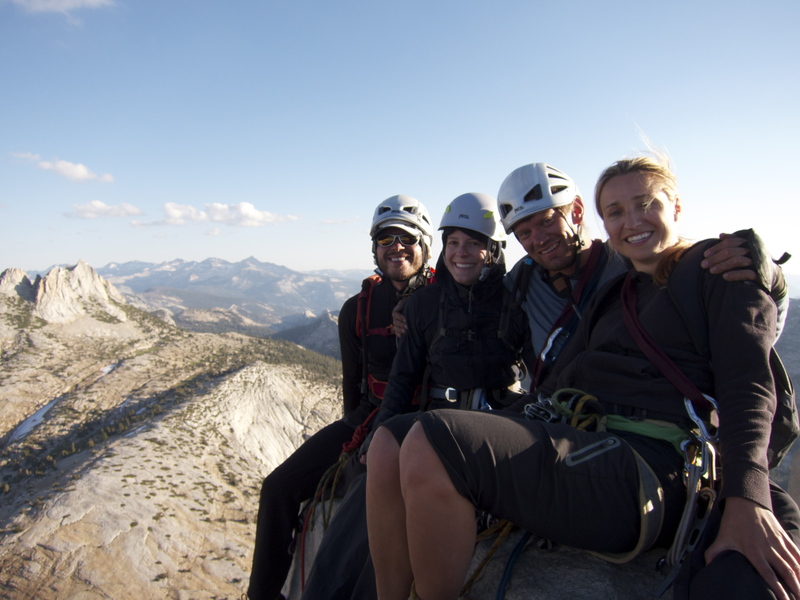 Marzena and Jill had never been up Cathedral Peak so the prospect of sharing such a special climb with them was highly appealing. However, we awoke to a rather cloudy morning and this made for a pretty lazy start to the day so it’s not surprising that we found ourselves at the trailhead organizing gear and getting ready to hike to the base around noon. By this point the clouds had started to break and the sky was mostly blue during the approach. I think everyone (except for Marzena) was feeling a bit tired so it was roughly 2 when we reached the leftmost route up the face. Just as we started to flake the ropes a brief period of rain struck. It only lasted for a few moments and by the time we got our rain gear on it had past. But the event was enough to make us consider if it was wise to start the route. A bit of deliberation later Linda decided that since she’d been on the route before the prospect of doing it again and potentially getting rained on wasn’t too appealing. Feeling (perhaps foolishly hoping) that the weather would hold and seeing the desire that Marzena and Jill had to do the climb I decided that I was game to lead the first pitch. We were initially going to ascend with me leading and Jill seconding on my rope while Ben would lead on doubles for Linda and Marzena to follow. But now that we were a party of 4, we decided that just having one leader would be the easiest way to go. Racked up with a set of nuts, a single set of cams from #0.5 to #2 and 4 tri-cams I picked a line for the first pitch and ran up it until I was out of rope. Ben followed trailing the two doubles for Marzena and Jill. Ben lead the next pitch and aside from managing three ropes at the belay the climb was going well, especially because the rain hadn’t returned. For the start of the third pitch we were just below the chimney section. This is typically where the many routes up the face meet and get funneled into a single stream of climbers. So I wasn’t surprised to see at least one party waiting to get through the section. However, Cathedral Peak is very featured and we’d read of variations to the left and right of the chimney that can be used to alleviate the congestion. No better time than now to try them. Here’s the variation that we took. On the very lefthand side of the ledge below the chimney pitch (typically the ledge that people belay from for the chimney pitch), go straight up for around 15-20 feet of very easy climbing. You’ll find yourself in a bit of a small corner with a fantastic hole in the granite that can be girth hitched. Up and left of the girth hitch there is a finger sized crack that leads out to an arête on the left. Keep your hands in this crack and move out to the very well featured and protectable arête. It isn’t obvious that there is anything out to the left to climb, but trust me, there is and the mysterious feeling adds to the adventure. From here you can continue straight up towards the summit, bypassing all the groaning and struggling parties in the chimney. At a rating of 5.7 and featuring some fantastic exposure, I can’t recommend it enough. After that section the rest of our route was pretty typical climbing for an afternoon on Cathedral. I got to the summit blocks and waited for some traffic to clear before making the final push to the top. 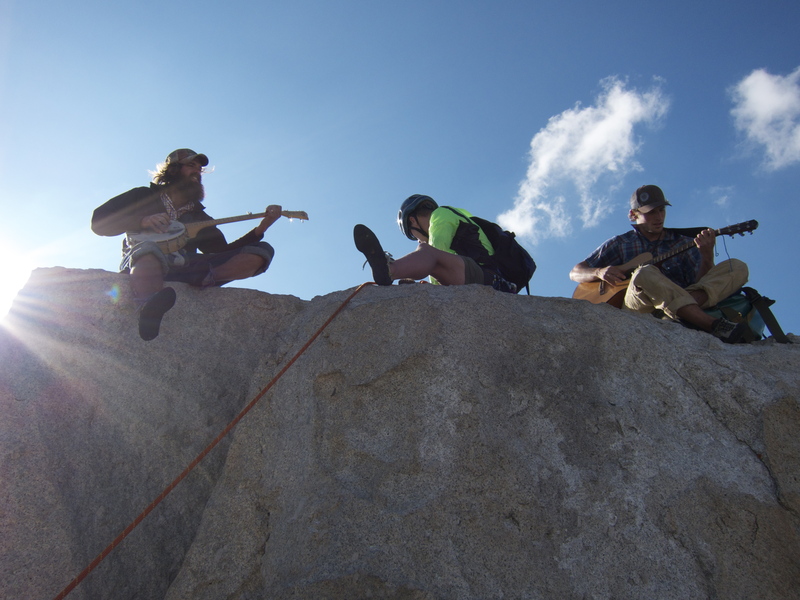 As I waited, two free soloists came marching up the rock, one carrying a banjo and the other a guitar. Immediately I began to smile, hoping that we’d get to hang out as a group on the top and enjoy a world class view with some accompanying music. After a short wait I brought Ben up to the party and he gave Marzena and Jill a belay while I shot some video of the music scene. Once we were all on top I couldn’t help but feel extremely fortunate. Not only did the rain stay away, it was sunny and beautiful. The climbing ended up being more enjoyable than I had even remembered. Plus I got to share a summit that is always incredible with three people that I am fortunate to have in my life. Add into that the mood that the music set and it’s a day that can’t be repeated. 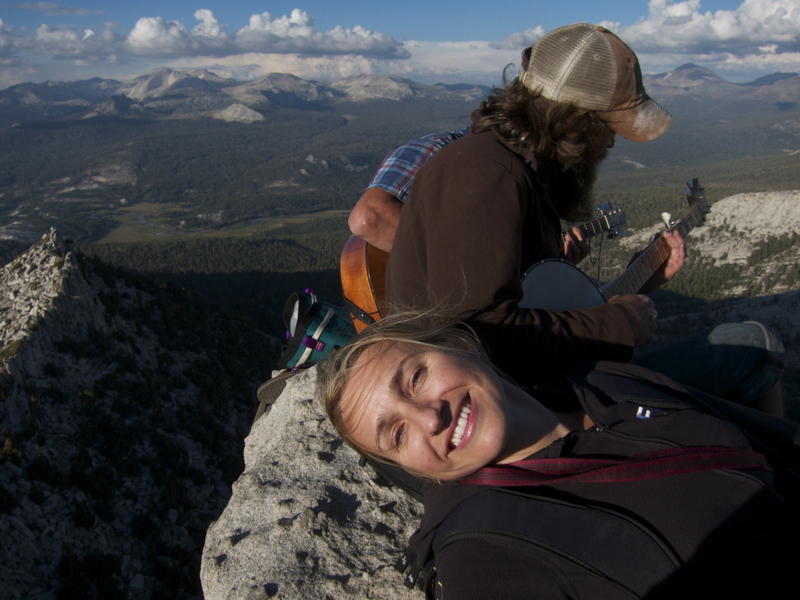 We ended up sitting on the summit for almost an hour, soaking up the sights and enjoying the music. I can’t thank everyone enough for making that one of the more memorable and enjoyable hours that I’ve had. The only bummer of the day was that Linda didn’t get to experience it with us. However, I did manage to get a couple videos where the wind didn’t totally destroy the audio. I’ve posted them below along with a couple other photos from the day. Two adults, two boys, one bathroom and no shower. I suppose in this century many would call us tough, or nuts, or… dirty for living in such inhospitable conditions for nearly two decades (yes, there’s some sarcasm in there). Whatever you want to call it, I played in the dirt and took baths for my entire pre-adult life. In fact, a shower was such a rare thing that I actually have a memory of visiting a relatives house and using their shower. Given the fact that I can’t remember who the relative was, only the experience of cleaning myself while standing, should be a good indicator of how ingrained bath time was for me. Sure, I had to take showers after P.E. class in junior high but that was different. At the time those were events where you were forced to get naked in front of all your same gender peers, go into a big room with water coming out from everywhere and find the delicate balance between getting clean and getting out. That’s not a shower, it’s forced awkwardness made worse by the one kid who either didn’t feel awkward at all or was completely overwhelmed and reacted by goofing off and occasionally touching other kids. Perhaps this was the driving force behind being a fast runner… getting to the locker room first so I could be in and out in relative solitude. So yea, showers were rare and generally not enjoyed. Thankfully this changed when I left home. In college the showers were private and outside of the occasional incident when someone would jokingly empty a trash can into your stall, they provided me an atmosphere to focus on the intended task. I don’t remember how, but at some point in my freshman year I discovered something interesting about my washing ritual; I washed my hair after washing my body. In a bathtub it’s logical to wash your hair second, or at least it’s logical to me. But in the shower, applying a top down approach is naturally the right way to go. Being someone that appreciates and strives for logical approaches (even when it’s a bad idea) I changed and have been washing my hair first for almost 14 years now. Up until last week. Last week I ran out of liquid soap and turned to a bar of soap that I’ve had around. It’s typical for me to be thinking about some problem while in the shower and therefore my mind is pretty distracted. So when I almost got out of the shower without washing my hair I laughed at my focus induced forgetfulness. The next day the same thing happened and I started to get a little worried about myself. Day after that, remembered to wash my hair but once again it came second to my body. Same for the fourth day. Now to make things a bit more interesting, for the last three days I’m back with liquid soap and washing my hair first has come back naturally as well. Okay, perhaps some won’t find this very interesting, but to me it’s fascinating. I’ve got 14 years of a daily pattern: washing hair first and body second using liquid soap. Growing up we mostly had bar soap so for those 18 years the pattern was: washing body first and hair second using bar soap. So on the surface, it appears that my mind made some strange connection that tells me to instinctively wash my body first when using bar soap, no matter where I’m washing myself. Of course this could all be coincidental, but I don’t feel like it is. I find it to be a really fun example of how pliable our minds can be while at the same time be disappointingly literal. It’s as though I hadn’t changed my behavior, I just learned a new behavior for a new set of paramaters. If this is in fact what’s happened, it’s both a useful and a disturbing detail of our minds. On the useful side, it means that we can subvert a behavior with a new one by just changing some of the paramaters in our environment. But what’s disturbing is that the old behavior seems to linger and will show itself when the old conditions are present once again. Makes me wonder how much we really change as people. With enough duplication of my childhood environment, would I go back to behaving the same way I did when I was a child? One comforting aspect is that while maybe we don’t have as much control over our behavior as we perceive, perhaps that’s offset by our ability to influence our environment. Of course I’m not a psychologist or sociologist. I’m just a guy who has part of his mind stuck in a bathtub.